Twenty-three new schools will join Northwestern University’s FUSE Studio program this fall, thanks in part to a recently announced partnership with CompTIA, the nonprofit trade association for the information technology industry. 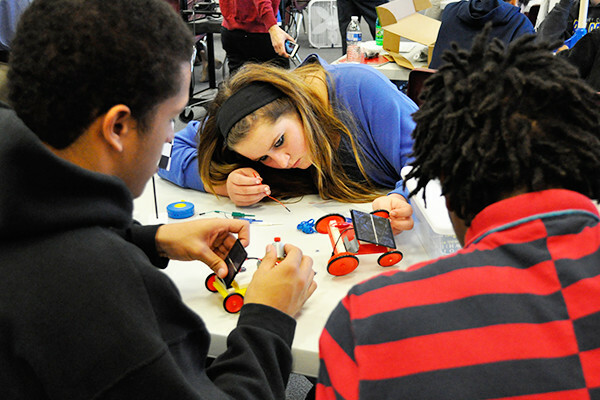 FUSE, an educational program developed by Northwestern’s School of Education and Social Policy (SESP), brings interactive STEAM (science, technology, engineering, arts, math) learning to middle and high school students. FUSE educators facilitate hands-on learning in specially equipped design studios, helping students develop skills for a rapidly changing job market. Students work alone and in groups to build robots, design homes using professional software and craft items of their own design using 3-D printers. Stevens notes that the students work together on challenges, learning together and sharing what they’ve learned with one another. FUSE program researchers are studying these learning phenomena through support from the NSF. FUSE will expand to a total of 68 schools this year, bringing its total to 136 schools in the United States and Finland. The partnership with CompTIA alone will expand FUSE Studios to more than 2,000 new students in 10 states, including California, Colorado, Florida, Illinois, Kentucky, New Jersey, New York, Oregon, Pennsylvania, and Texas.